A local band, The Off Years, is a three-piece band from Sacramento that gets its name from the time period when the group was not together. Despite having known each other for over a decade, the band has only been playing together for three months and already has venues booked. The group recently performed at Chalk It Up, an annual art festival that took place on Labor Day weekend in Fremont Park. Band members Emma Simpson and Orey Severet elaborated on the origin of the name. “Just that we were apart and now are together,” said Simpson. 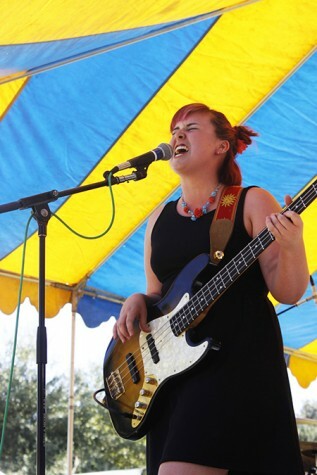 Lead singer and bassist Simpson went to high school with her boyfriend, guitarist Brodie Mills, a former American River College student. The drummer, Severet, met Simpson at “Stairway to Stardom” an eight-week summer music program for young, non-professional musicians. All of the members confirmed that they felt their music had strong ties with jazz music. “I like the improvisational aspect of the way we play… we never play the same song the same way,” said Mills. In its introduction at Chalk It Up, the Off Years was compared to the Talking Heads. Simpson recounted the time she spoke to Tina Weymouth, a founding member of the Talking Heads, on the phone. 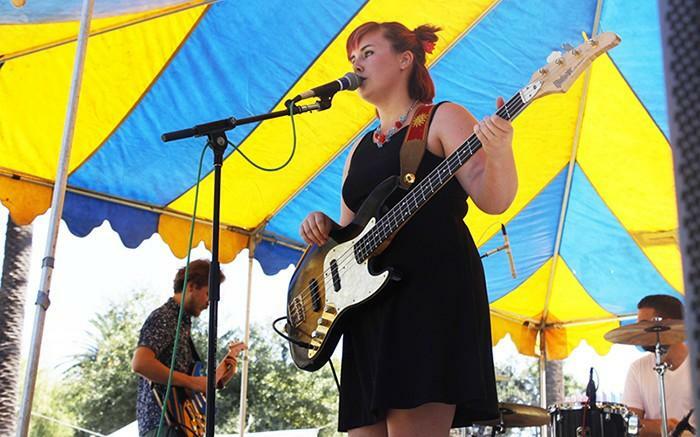 Lead singer and bassist, Emma Simpson, sings at Chalk It Up’s 25th annual art festival on Labor Day weekend in Fremont park, downtown Sacramento. Simpson was an expressive performer and interacted with her fellow band members and audience members. “I asked her, ‘How do you ignore the sexism that is in the music industry?’, and she told me to just stay away from the people who are apart of it,” said Simpson. Among some of their favorite artists/bands included Pink Floyd, Led Zeppelin, The Kills, The Red Hot Chili Peppers, The Talking Heads and most specifically the former drummer Joe Morello, from the Dave Brubeck Quartet. All of the band members elaborated on what they love about music and live performances. “I love performing. It makes me feel very free and powerful for 30 minutes… no bad stuff happens. It’s a really good way to be in the moment,” said Simpson. “My favorite thing about music is… I like that you can connect with everybody… I don’t speak Spanish, but someone who does could totally understand through the expression of it,” said Severet. “I like seeing the people watching us smile, I’ll find the person who is not fully into it, and I’ll play for them,” said Mills. The Off Years will be opening tonight for the Australian Band, Big Scary, at Brick and Mortar Music Hall in San Francisco. Doors will open at 8 p.m.
1 Comment on "Sacramento band shares its origin story"
I knew my grandson Brodie Mills would go far. What a great tribute for you all!